What’s that? No bacteria in my sponge? Say it ain’t so. Remember the great Sponge V. Dishrag debate of 2009? I have a follow up for all the sponge haters out there. Nate and Cate did a science project together last month. They went around the house with Q-Tips, swabbing all sorts of surfaces, and then growing bacteria in petri dishes. When they were collecting their “samples,” I had just finished doing the dishes and wiping down the counters with my sponge. We swabbed both sides of the sponge really well to include in the experiment. Guess what? NOTHING grew in that petri dish. That’s right, Nate’s ear grew more junk than my sponge did. Okay, so this was not the most controlled experiment and we’re pretty sure that Nate’s ear sample was contaminated…but still. Just sayin’. No fungus, bacteria, virus, nothing grew in the sponge’s petri dish. Let the furor begin! I know the dishrag folks won’t take this lying down. Even though the scientific evidence is indisputable…okay, maybe not indisputable, but whatever. And, for the record (a record that will make the more Type A personalities cringe), the sponge was 1-2 weeks old and I had not run it through the dishwasher or microwave at any point in time. Guess those poor sponges are getting a bad rap for no reason, eh? I have finally found a pumpkin pancake recipe that I like! 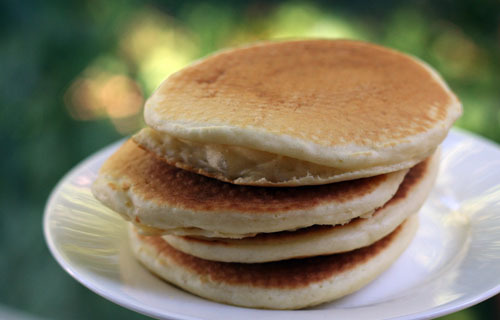 I’ve tried mixes, I’ve tried making them from scratch…and generally the pancakes come out flat and gooey. Cate’s preschool recently made pumpkin pancakes and shared the recipe they used…and they’re perfect! Yea for preschool teachers! Please note: The recipe below uses Krusteaz Buttermilk Pancake mix. If you have Bisquick, please click her and use the modified version of this recipe. Thanks! 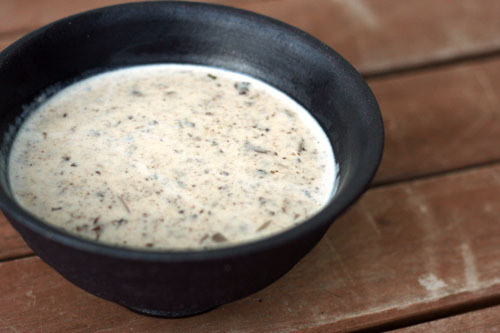 In a medium/large bowl, whisk all the ingredients until just blended (batter should have lumps). Spray heavy griddle or skillet with nonstick spray and heat griddle over medium heat. Spoon 2 tablespoon (I did ¼ cup) batter unto griddle to form each pancake. Cook until edges are drying and bubbles start to pop, turn and cook a few minutes longer. Serve with lots of butter and maple syrup! Today we have a giveaway – yippee! 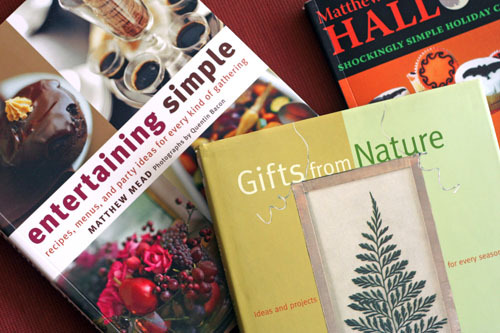 Matthew Mead will be giving away a set of three of his books – Entertaining Simple, Gifts from Nature and Matthew Mead’s Halloween – to one lucky This Week for Dinner reader! Simply add a comment to this post by Midnight PT, Sunday November 1 to put your name in the hat! One winner will be randomly selected and announced on Monday, November 2. As you know, I’m really enjoying these books. I’m excited to get the chance to share them with you! Big thank you to Matthew Mead for such a great giveaway. And good luck to everyone! Speaking of pancakes, I’ll have a great pumpkin pancake recipe for you later this week. And a giveaway! I am loving all the menus we’re getting every week! They really are so helpful to read through as I plan, and there are so many great ideas. Please keep the menus coming! Back when I first started this here blog, I mentioned a website that I liked, MatthewMeadStyle.com. This website is chock full of wonderful things. I was delighted to receive an email from Matthew Mead not too long ago asking if I would like to review one of his books. 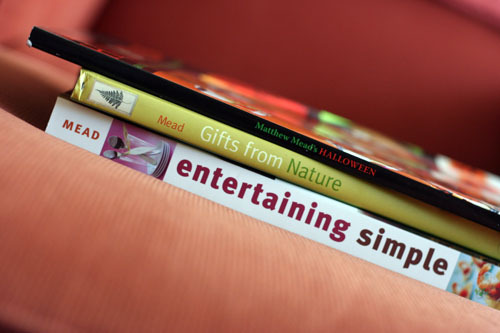 Of course I jumped at the chance and Matthew sent me THREE of his books: Entertaining Simple, Gifts from Nature and Matthew Mead’s Halloween. I love all the books. 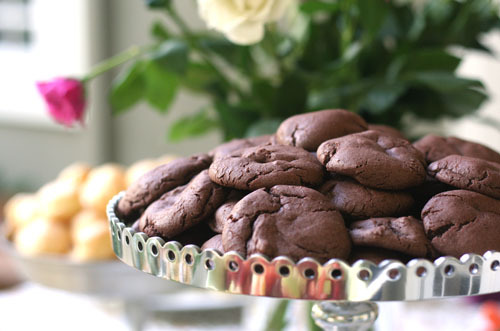 Matthew has impeccable taste, is a great writer, and the recipes that are included look divine. Entertaining Simple is fantastic. 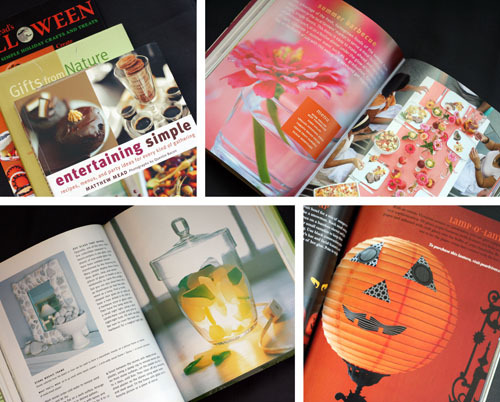 So many wonderful entertaining tips, decoration ideas, menus and recipes…it’s really lovely. And Gifts from Nature is a wonderful resource, complete with great ideas for every season of the year. And if you’re dying to get your hands on Matthew Mead’s Halloween, you’re in luck…it’s on newsstands now. I saw it at Safeway just the other day. I love Halloween and this book did not disappoint. My favorite part of the book is all the pumpkin decorating ideas. CUTE stuff. I’ve told you before, I only write about products and books that I like. And usually when I like something and write about it…well, it’s good news for you…perhaps I’m seeing a giveaway in your future? You’ll just have to check back to see! Don’t miss my post today over on Make and Takes, The Joys of Meal Planning with Kids. Hope you enjoy it! 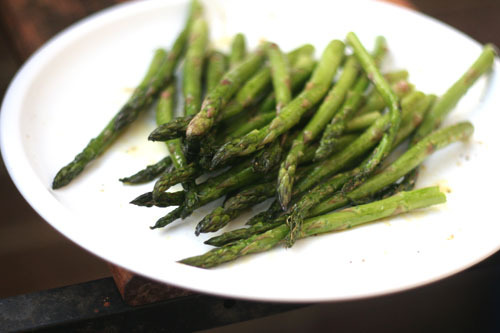 When I first wrote about grilling vegetables, someone mentioned asparagus was one of their favorites to grill. I can see why…I tried it, and the asparagus cooked so nicely on the grill, resulting in a really great texture. I still think roasting asparagus in the oven is a great way to do it…but grilling is now my favorite method for this vegetable. Did I mention the girls INHALED their asparagus? And mine? And Nate’s? I think Nate & I only got to eat a few spears in the end! Believe it or not, you’re going to have to endure another grilled vegetable post…I ordered a grilling basket and it arrived this week! My next veggie venture on the grill? Broccoli! I went to a baby shower brunch yesterday. 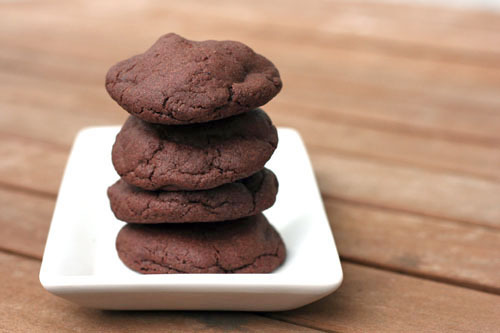 The food was so good, including these amazing chocolate cookies…I’ll get the recipe for sure! On to the menu! It’s kind of a combo of the last two weeks’ menus…stuff that I didn’t end up cooking. 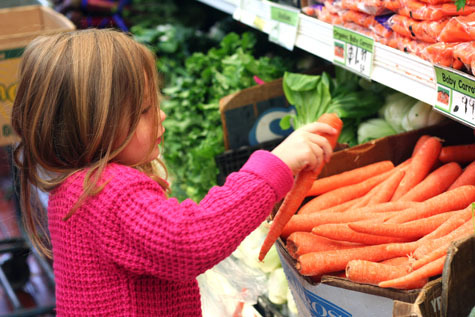 Please share your menu for the week! Can’t wait to see all your comments!